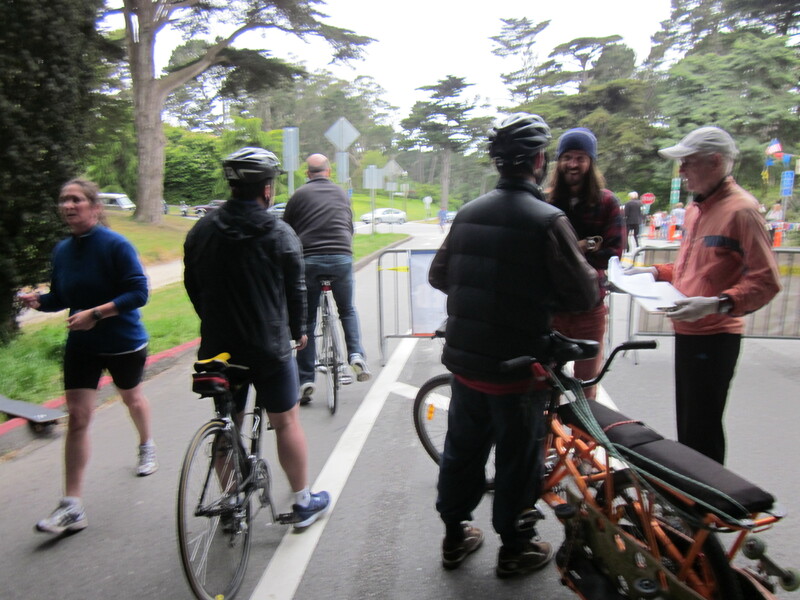 The usual Sunday closure of Golden Gate Park to cars. None of these things affected us on our bikes. We were waved through barricades all over the city. Matt and our son spent the first half of the weekend in Reno at a martial arts tournament. When they returned they wanted to get dim sum. And the kids’ shoes had actual holes in them, so we could no longer put off replacing them. 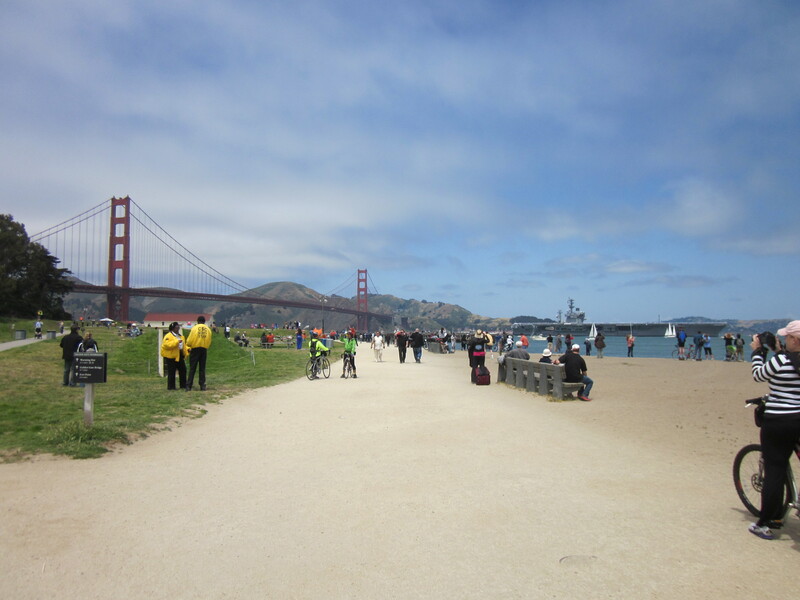 And I wanted to visit the Golden Gate Bridge Festival in the Presidio, just because it seemed like the right thing to do. Historically, this is the kind of travel that we used the car for—unavoidable hills are all over this route. But with every news source and person we knew shrieking, “DON’T DRIVE ON SUNDAY!” we rode. And it was fantastic. Our preferred dim sum restaurant is near our old apartment, on the other side of Golden Gate Park, and parking a car there is a nightmare—but the bike racks in front of the restaurant? Unclaimed. 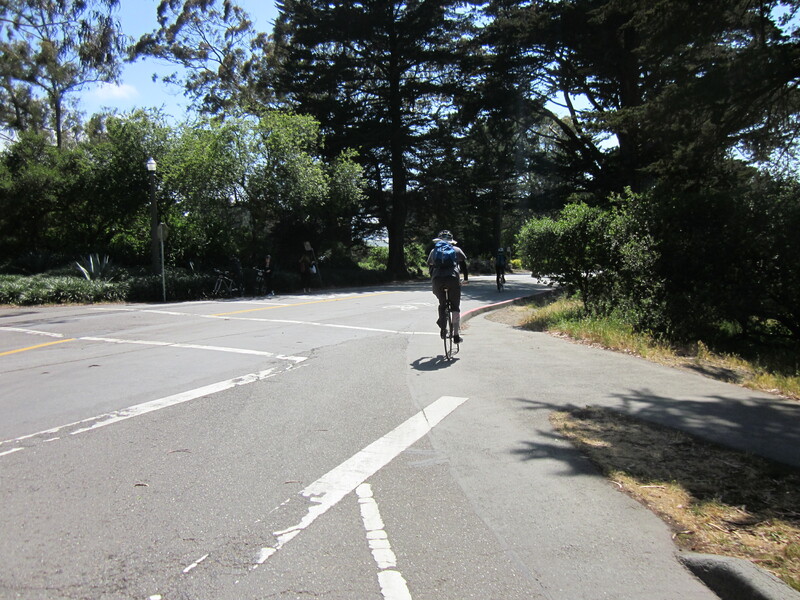 On Sunday morning, riding through the closed-to-cars streets of Golden Gate Park on the way there is also unbelievably pleasant. There were hundreds of runners in the park, some of whom actually tried to race me. This is ridiculous. Even I, with a kid on the back of a heavy bicycle, can effortlessly outpace a fast runner. It turned out they were there for a footrace, and the finish line backed up the bicycles heading out of the park, so I guess the runners got their own back. I ended up behind a Yuba Mundo dad carrying two skateboards for his sons, one of whom was riding on the rear deck. 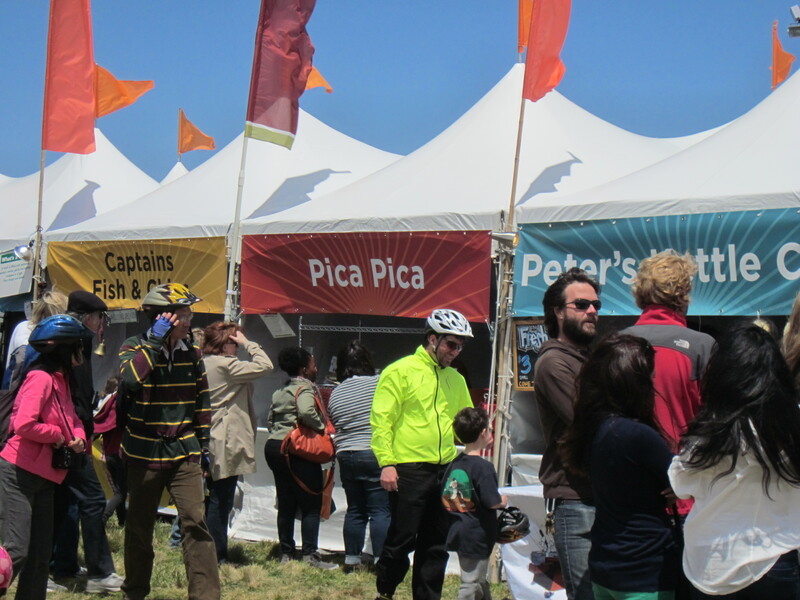 After dim sum we headed into the Presidio for the bridge festival. This was billed as an afternoon-to-evening event, but one of my yoga teachers was offering a sunrise class for the festival so I knew it was an all-day affair, and I figured it was better for the kids to get there early before the crowds got thick. On the way we passed the house of some of our son’s classmates who live in the Presidio and while catching up, played in their backyard, which has stunning views of the ocean and the coast. On the way in we also saw the first wave of unwitting drivers being turned away at the gates; this was a sight that would become familiar by afternoon. 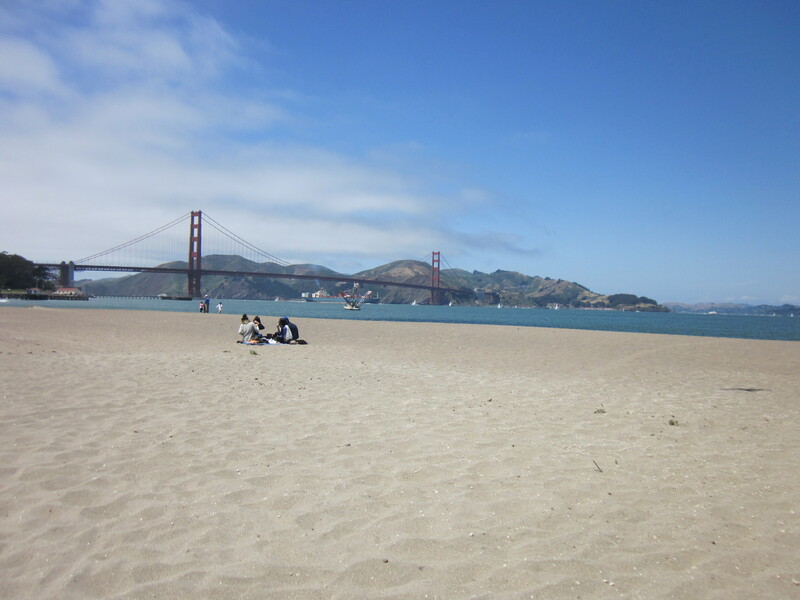 At the Presidio people were already staking out spots for the evening fireworks. Because we had no ambitions on that front we just watched the battleship Nimitz head under the bridge, and the fireboats spout water, and the kids built sandcastles on the beach. There was bike parking everywhere and three food plazas filled with representatives from food carts throughout the city—for once, we’d hit an event with organic ice cream and paella instead of cheap soft serve and nachos. And most of the people we saw once we reached the park had heeded the advice not to drive, so, oh, the bikes we saw. I have never seen so many tandems (most were rentals). I saw an amazing cargo bike, with a flat bed in the front and a child seat in the back. “I love your bike!” I yelled, “What IS it?” It turned out to be a custom Bilenky, made in Philadelphia. The dad riding it had bought it when he lived in Manhattan. 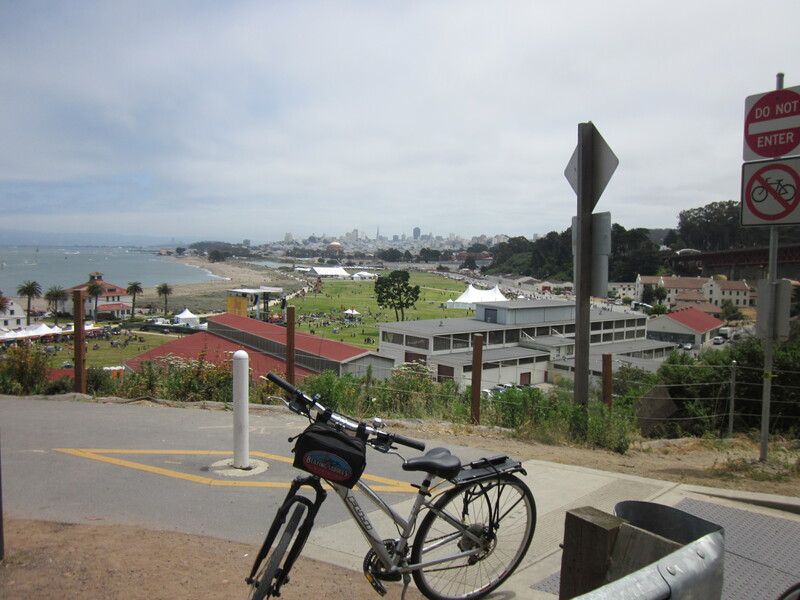 Now that he lived in the Presidio, he could ride it along the waterfront, but he was frustrated that it couldn’t handle hills and was thinking about an electric assist. At our next stop, fittingly, we saw a Hebb electric bicycle, and when I asked the woman riding about it, she told me that she used it to commute from the outer Avenues to her office on the top of Nob Hill (some of the steepest grades in the city, which make the hills around our place look like gentle slopes). She obviously loved her bicycle. It is not my kind of electric assist—the Hebb has a front hub motor that is independent of the pedaling, rather than a pedal assist—but it was the right bike for her commute. 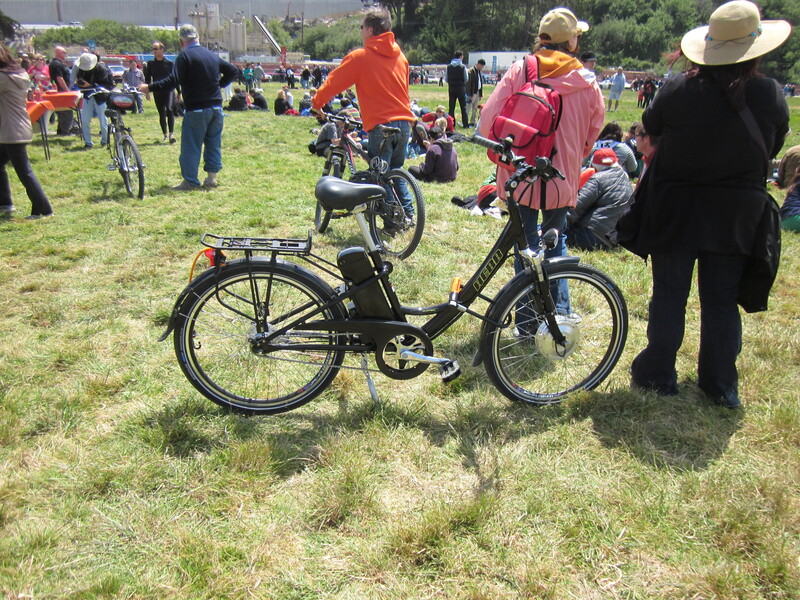 She even offered to let me ride it, which was very sweet, but in the crowds, given my inexperience and the potential speed of that bike on the flats, it seemed too risky. My spendthrift road-bike adviser leaves us in the dust. 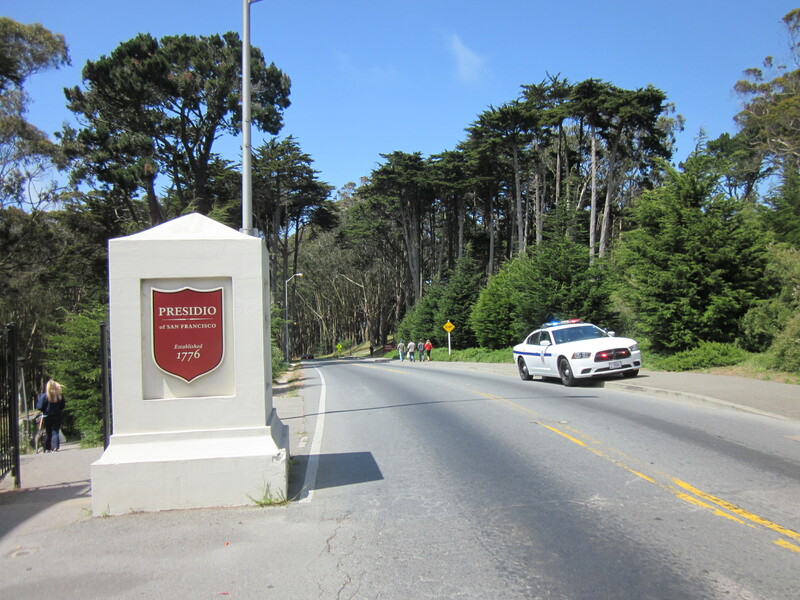 We rode back out of the Presidio to the kids’ shoe store, which was the emptiest we’ve ever seen it as everyone was headed toward the bridge by then. And we rode home down my normal commute route, meeting some road bikers along the way, who were entertained by our child-hauling ways. 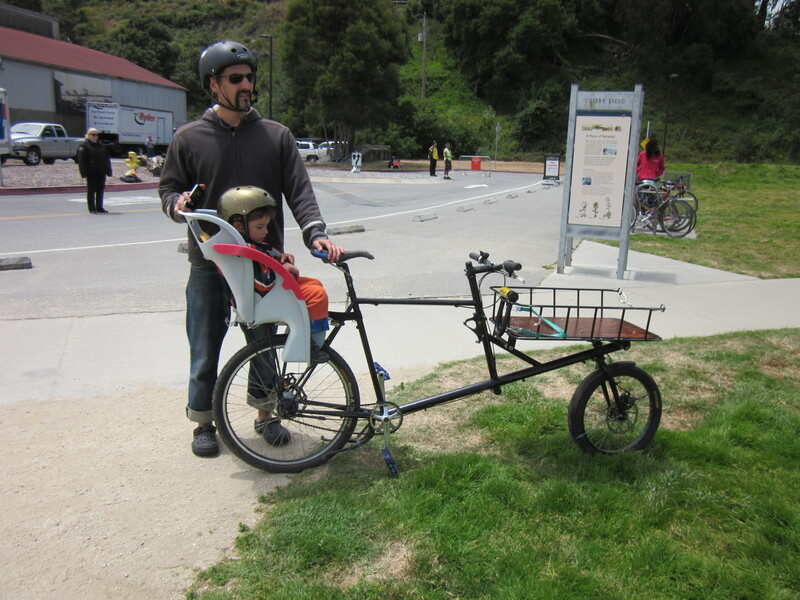 One of them told us we should make the kids work and get a tandem like he had for his kids: a Co-Motion, which can handle huge height differentials like those between parent and child, and can climb serious hills. I told him my brother-in-law had told us the same thing (he has!) but it was a pricey bike. “Think of it as a car replacement,” he told me. “The maintenance cost for a car is over $3,000 a year. That means you can buy an expensive bike every year instead and still come out ahead!” I told him my brother-in-law had used that logic for a decade and it was not making my sister happy. I was so bummed that this stand was not actually selling chalk, glass, and ice. Just mildly spicy food. When we got back near home we stopped by Everybody Bikes to pick up my Breezer, which was ready at last after a week. The shop was dead when we arrived, but things picked up 15 minutes later as a half-dozen people piled in after discovering their bikes had flat tires after months in the garage. They were all planning to ride those bikes to the bridge festival. Usually, our neighborhood is packed on weekends, but it was clearing out. In past years, we would have avoided the bridge festival if we could, fearing the crowds and the traffic. Golden Gate Bridge itself would never have missed us, I know; it is, in the end, just cables and steel. But I feel better having gone. Celebrating the places we love with everyone else in the city is what makes us part of San Francisco. And on our bikes, I feel like we belong here. 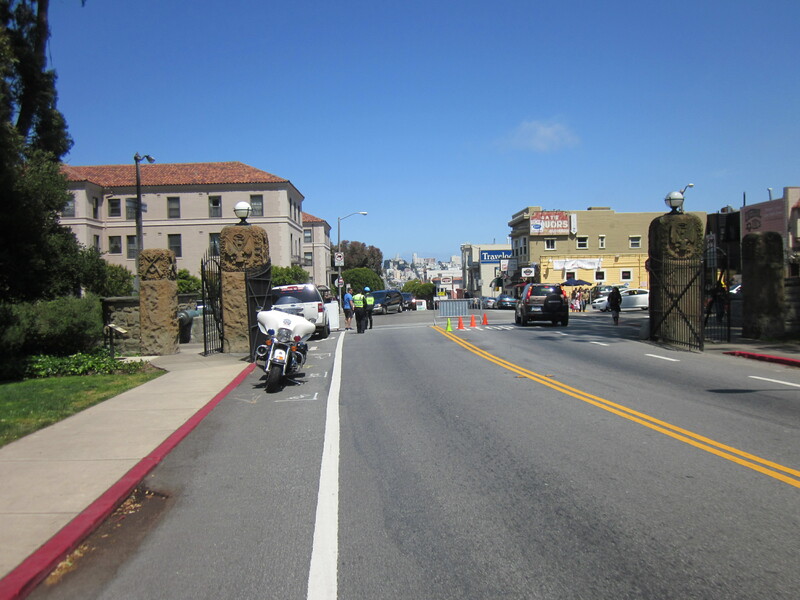 By looking around for posts about the Golden Gate anniversary I found your site and loved it. How much I would have loved to be there with a bike! S.F. is such an amazing place. Thank you! It was a great ride, and a wonderful day. I can’t believe you climbed the bridge! I was only carrying one kid, of course. I’m guessing you also drop runners when you’re not hauling both kids and half your household goods on the Dummy.